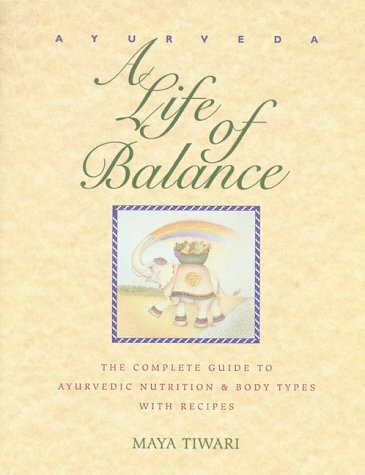 Here is a wonderful book, Ayurveda: A Life of Balance, written by Maya Tiwari who tapped back into her Ayurvedic roots when healing from cancer. 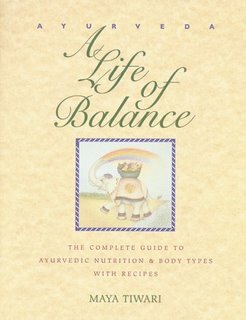 It's a massive volume separated into parts that focus on the principles and practice of Ayurveda, and universal recipes for each body type. The recipes are a great window to variety in grains, pulses and vegetables, with traditional meals as well as modern international ones. But what's most enriching in this book is the description of the cosmic roots of life that bind us all together, plus the indepth analysis of the "psychospiritual nature" of each body type. I found her sentiment and connection to life so profound and inspiring that I posted an excerpt some months ago on this blog. I see Ayurveda as a way of thinking and living, like the "yoga of life", a prescription for consciousness and balance and a reminder to stay in touch with the world within us and around us. A Life of Balance is a guide that merges stories and customs, and gently instructs in how to live and eat to try to achieve that balance.